But if we look at Scripture a little more, we see another concept concerning this Woman whose legs are flying furiously. WINTER CONSTELLATIONS-SEEN IN FALL: REVELATION CH. 12: This sketch to the right is how this constellation group appears in the eastern sky in fall. This is the four primary constellations of the Winter Constellations. They can be seen in this position, in the late fall above the eastern horizon. The Woman of Revelation 12 is commonly called Ursa Major or The Big Dipper and appears in the north. Orion the Soldier is the at the bottom is to the south of the Woman. The The Dragon of Revelation Constellation’s mouth isThe Hyades Cluster, and the tip of his tail is Pleiades, and his Wave of Water is primarily the Auriga constellation. The Glorious Horse Constellation head is of Perseus Constellation and his rear end is Cassiopeia Constellation. So what other reason could there be for such a dramatic exercise? Why else would our Virtuous Woman be running so fast? SO WHY DID GOD GIVE US THIS CONSTELLATION? Let’s see what Scripture says about running…. “Know ye not that they which run in a race run all, but one receives the prize? So run, that ye may obtain.” 1st Corinthians 9:24. So Scripture not only speaks of fleeing to the mountains, but also of running the Christian Race! This above verse really says it all! She’s in a race! Well, if she’s running in a race, then it would seem logical that there is a prize to win. So what could possibly be the prize that she is running to win? OK, she’s running for that Crown, that Crown of 12 stars in the sketch below. (13th star in the middle is symbolic of Christ). This sketch of the Summer Constellations, shows this same Woman of Revelation 12 of the Winter Constellations. But now, in the Summer Constellations she flips upside down, and now appears as a woman with child, reaching out to grasp this Glorious Crown Constellation. Well a crown is nice. But there has to be just a bit more information about what this crown is all about. SKETCH WITH JOSHUA TREES…The above sketch are the Summer Constellations as they appear when in the western half of the night sky. 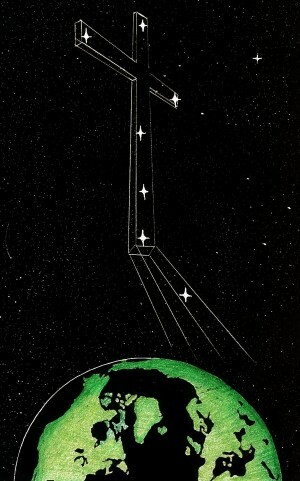 The box-like constellation is the The Ark of the Covenant (AKA Sagittarius Constellation) is in the south. To the right is both the Flower of the Field Constellation and above the flower is The Cross/Scepter Constellation. Further to the north is the Crown of Revelation Twelve (AKA Corona Borealis ) and the star, Arcturus . Farthest to the north is the Woman of Revelation 12 part one (Woman in Travail) (AKA Ursa Major). Of course, in this sketch is the desert with several Joshua Tress and some mesas, and a few other plants. Well a cro wn is nice. But there has to be just a bit more information about what this crown is all about. So this above verse let’s us know that the crown also represents all those who the Christian is praying for….“Therefore, my brethren, dearly beloved and longed for, my joy and crown”. So Paul considered those at the church at Philippi (and the other churches as well) as part of his crown. Part of his prize. But what about all the fun stuff in the world? After all, a Christian has to have a little fun sometimes, right? Maybe that Virtuous Woman in the above picture, needs to “let down her hair” every once in a while. Get out. “Do up the town”, so to speak. So, is Paul being a little extreme and severe? After all, society tells us not to take religion too seriously! You might say that Paul was what society now refers to as, ‘a religious fanatic’! Well, shouldn’t we live a life more like the people of this world, with worldly aspirations and pleasures? The fact is, a Christian will never be satisfied with just a little worldly fun. There will always be a clamoring within, for more and more of this world! The Apostle Paul was God’s example of just what every Christian can become. And while we may not be called to travel by foot over tens of thousands of miles, as did Paul, we nevertheless are called to have Paul’s intensity of devotion to whatever our own particular calling might happen to be. We may never be shipwrecked like Paul, but there will be times of trials and despair in our own life, which will call for our unwavering faith and courage. So we, like Paul, can encourage others in the midst of life’s storms. If we only wish to venerate Paul, and put him on a pedestal, like in this photo…well…what good is that? God took a very corrupt man, and turned him into perhaps, the greatest role-model for the Christian, aside from the Lord Jesus. Oh it wasn’t that Paul was some sort of super-human. No, Paul boldly admits… “but I laboured more abundantly than they all: yet not I, but the grace of God which was with me.” 1st Corinthians 15:10. So there’s no reason to venerate Paul. It was God’s grace alone that made Paul into what he became. Without God, Paul was only a proud Pharisee. But through God, Paul became God’s chosen role model for every Christian. Paul exhorts every Believer to, “Wherefore I beseech you, be ye followers of me.” 1st Corinthians 4:17. So, when Paul speaks of running the Christian Race, then we can know for a certainty, that God is trying to help us to see our Salvation as something that deserves our greatest time, effort, and devotion. Most of us have heard a little bit about what many athletes do in order to prepare themselves to compete in the Olympics. Those athletes spend every moment of their lives in training, from the very day they decide to enter that most coveted competition. For years, those athletes have one thing, and one thing only on their mind: To win the prize! It doesn’t matter what other mundane duty they must perform, the “athlete in training” has a one-track-mind: to win the prize! The marathon runner knows that his personal diet is critically important. So he eats only the very best diet that will give him optimal performance. The marathon runner knows that proper rest is important, so he’s careful to get that required rest. This runner must train for hours, each and every day. He must push himself to greater endurance, and greater performance. He even keeps a journal to record his improvement. By this time, most of his friends have given up on the marathon runner, because they think he’s become a “terrific bore”, as of late. But that doesn’t bother him. This athlete has one thing, and one thing only on his mind: To run in a way, so as to win the prize! So why should the Christian be required by God to pursue his or her Christianity in such a way as this? Was there ever a race involving the Apostles? Well, in a sense there was. It was a race between the two Apostles, Peter and John. So there was indeed a race…between Peter and John! And that was a race to get to the tomb of Jesus. And this little scenario just happens to present a wonderful concept regarding the goal of each and every Believer: to get to Jesus’ tomb as soon as possible! Oh you don’t believe it, that we Christians are to race to get to Jesus’ tomb? Well, just listen to Paul… “That I may know Him, and the power of His resurrection, and the fellowship of His sufferings, being made conformable unto His death; If by any means I might attain unto the resurrection of the dead…I press toward the mark for the prize of the high calling of God in Christ Jesus.” Colossians 3:10, 11, 14. So we begin to see that Paul was extremely intent on becoming Christ-like! He wanted to experience all those sufferings which Jesus suffered. Paul wanted to be made conformable to the death of Christ, that he might, by any means, attain to the resurrection of the dead. Paul wanted a deeper and deeper experience in the fellowship with Christ and His sufferings! And Paul understood that it is through sufferings that the Christian dies a deeper death to self. So in essence, Paul, like Peter and John, was also in that race to get to Jesus’ tomb. And so this little race between John and Peter was really just a picture of that race which each and every Believer is exhorted to run. And it was no accident that John won. It was John who seemed to stick the closest to Jesus during those 42 months of Jesus’ ministry. It was John who leaned upon Jesus’ breast, symbolizing his great love for Jesus. It was John who was entrusted by Jesus, to care for His earthly mother, after He ascended. It was John who seemed to be there when the others seemed to disappear. Just look at this old painting of John to the right. Finally, an artist who got it right, concerning John! Most of those artists who painted John, did not realize that John wanted to be Christ-like in every way! That was the sole purpose of John’s existence. Now this painting to the right, shows that this artist understood John! This painting makes John appear in similitude to our modern-day conception of what Jesus looked like! And this is the same concept which Scripture paints concerning John. John had become totally Christ-like! And though no one knows what Jesus actually looked like, it is only important that John’s painting here was a definite attempt by the artist to paint John in the similitude of the popular conception of Jesus. But back to the subject of running the Christian Race: what was the prize that John won for winning this Christian Race to the tomb of Christ, thus winning the Prize (symbolized by that little race between Peter and John)? Well, for one thing, John became the writer of more books than Peter. Perhaps this was one of the blessings that came upon John. And John received the privilege of receiving the Revelation. And from reading John’s Epistles, we get the sense that John had become so much like Christ, that it was no longer John speaking in his letters…it was Jesus! John, it seems, had completely died to self, by the time of the writing of his last three epistles. And this seemingly complete and utter merging with his Lord Jesus is what makes John such an encouragement to all who are familiar with John’s writings. No, John never said, as did Paul, “Be ye followers of me”. But the obvious completeness of John’s merging with Christ is an unspoken call to each and every Believer to, “come up higher”. As we read John’s letters, we realize that we too, like John, can reach a much much higher level of Christ-like perfection than we ever before thought possible. And so, the Christian Race is God’s challenge to every Believer. Like that Crown which the Woman in Heaven is trying to grasp, so also, there is a Crown which is likewise held out for us too! And this is the prize which God holds out to us, today. The same prize that John won. The same prize which Paul won. The love of Jesus! Love that is willing to endure all sufferings for Christ’s sake. Love that is willing to agonize in behalf of, not only our loved ones…but for our enemies too! Oh what little love this world has! How much do Christians miss out on the wonderful gift of God’s Great Love for even those who hate Him! If only we Christians could realize just how much Heavenly Treasure we throw away, in order to cling to our little earthly trinkets! Listen to what Paul exclaims… “Now unto Him that is able to do exceeding abundantly above all that we ask or think, according to the power that worketh in us” Ephesians 3:20. So from this verse it begins to be seen that, no matter what one believes that God can do within him, God can do more…exceeding more abundantly! Both these men had died to self. And being dead, then Jesus could freely live out His life of Agape Love through these two men. This is the death we also must die! And this is the race we also must run, if we are to attain unto such a death! And being dead, then Jesus will be able to live out His life of Agape Love through you, and through me! BUT I’M NOT EVEN IN THE RACE! WHAT’S WRONG? There are many, many, Christians who know nothing of running the Christian race. In so much of Christendom, this concept is rarely discussed in-depth. Many have only a dim awareness of what is means to, “forsake all and follow Him”. And even when this concept is mentioned, it is extremely rare to find someone who actually is casting aside the things of Earth, in order to run, in such a way, so to win the Prize. We read these words “forsake all”, but we have been so conditioned by society to pursue the things of the world, that we remain in stark unbelief that the Bible really means what it says! But even for those of us who are aware of our high calling, we may even feel spiritually paralyzed. The reason why so many of us are seemingly not even running, is found in the above passage…. “let us lay aside every weight…and let us run…”. Most of us are trying to bring many of the things of the world along with us in our upward journey. Listen to Paul’s testimony… “Yea doubtless, and I count all things but loss for the excellency of the knowledge of Christ Jesus my Lord: for whom I have suffered the loss of all things, and do count them but dung, that I may win Christ” Philippians 3:8. This passage reveals the secret to winning the Christian Race. Paul was more than willing to let go of any and every thing. Paul realized that Jesus had totally renounced this world and owned nothing but the clothes on His back. Paul was overjoyed to do the same. He had no family. He had nothing preventing him from forsaking all things, that he might, “win Christ”. And even if we are intertwined with earthly commitments, we can still turn our focus heavenward; praying continually for God to change our circumstances, so that our family might be willing to likewise forsake this present world in exchange for that world Everlasting! But even if one’s circumstances happens to be like a modern-day “Lot”, he or she can still rearrange their life, so that they can devote as much time as possible with the Word. For instance, they can carry a little Gideon’s Testament, and stop at times to commit some verse to memory. And they can keep a prayer always under the breath, while going about the daily duties. Listening to Scripture on MP3 while on the go…or while lying down. God knows each heart. If the Christian has truly forsaken this world in his or her heart, He will put ideas in our minds, just how we might run that Race and win that Prize, even amidst the many duties of the day. And as time passes, God just might allow us to be freed up from som e earthly commitment, allowing even more time for meditating on His Word. And so, step by step, God will bring us closer to the life of Paul…to the life of John…to the life of Jesus! More and more, we will ever so imperceptibly become, “changed into His image, from glory to glory, even as by the Spirit of the Lord”. (see 2nd Corinthians Ch. 3). Then this painting of John will likewise be our portrait (a portrait of our heart). Never be overwhelmed by the “Christian Race”. Never be overwhelmed by amount of miles that Paul trod. God is probably not calling most to do that, at this point. 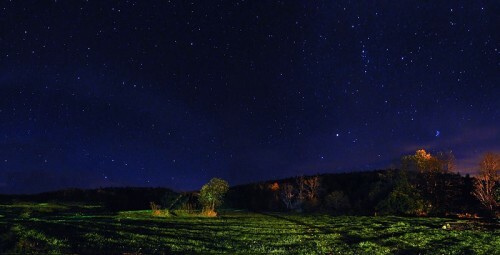 The “Good Fight” can be won as a Christian walks, perhaps under the canopy of the starry night sky… praying for his or her self as well as others. The “Christian Race” can be run as the Christian lay in bed, making a complete surrender to Jesus in heart. To simply hide under the shelter of God’s wings, trusting in His grace, and feeling totally helpless, is perhaps the greatest victory that a person can win! Listen… “commune with your own heart upon your bed, and be still. Selah. Offer the sacrifices of righteousness, and put your trust in the LORD….I will both lay me down in peace, and sleep: for Thou, LORD, only makest me dwell in safety.” Psalm 4:4, 5, 8. God has not given every one the same energy level. Some Christians may be, “busy Marthas”, always abounding in the work of the Lord. But there are also others, like Mary Magdalene, who can only sit at the feet of Jesus, and hear his Word. To hear God’s Word is the best work. So that Christian who perhaps, can only lay in bed and pray, or listen to an audio Bible, may win the Christian race, before those who are veritable-dynamo-Apostle-Paul’s! ARE WE LIKE THE PALSIED MAN? Remember that story in Mark, Chapter 2, in which a palsied man who had to be let down by his four friends into the house, to receive healing from Jesus? That man couldn’t even walk! And yet Jesus gave him victory right then and there, prior to him receiving healing. And if I am spiritually palsied; not able to do the slightest Christian duties. I too, may feel like the weakest of all saints. But like that palsied man, we too may get the victory, though we cannot seem to walk or fight, or run, spiritually. Because, the real victory is won when a person truly forsakes all in his heart, to follow Jesus, as one of His Disciples! Nevertheless, unceasing prayer for great grace and healing should be offered, that we may be strengthened, just as that palsied man, who got up and began to walk. Palsied Man Let Down through the Roof -James Tissot Brooklyn_Museum wikipedia pub.dom. How does music affect my spirituality? How does today’s music affect my running in the Christian Race? Can the things we read and the things we see, or even the things we listen to have an impact on our spirituality? So this article explores just what does music have to do with this fleeing woman? Lots! Just read and find out!